When it comes to software developers, there are literally hundreds of potential channels to follow. New programmers can easily become lost in the plethora of information. However, there are a few channels that are truly worthwhile. This is one of those software development lists where software developers who know what they are talking about can easily be found and followed. Jeff Atwood is one of the co-founders of Stackoverflow.com. This site is the go to site for developers looking for answers to questions about code – any code. Answers are provided for problems ranging from basic HTML to complex PHP and beyond. Maybe the whole world would be a better place if we all just went to @Disneyland​ today. For programmers that want to stay up to date on the latest trends and social development, Jesse Stay is the person to follow. Jesse is the founder of SocialToo, a friend list organizer for multiple platforms. After 25+ years online, I still have the effect of bringing any forum thread, no matter how active, to a halt simply by posting to it. Eric Meyer is known for his drive to have a standardized web, especially in the world of cascading style sheets (CSS). This drive has revolutionized the way that website design and development is done. PHP is one of the most commonly used web coding languages. For this reason alone, Rasmus is worth following. His feed is filled with useful coding tips and hints. After 15 or 20 years, babies get really heavy. For those involved in tasks such as Google Tools and other Google related tasks, insights into how Google’s code works can be extremely helpful. Chris DiBona would be the one to ask. He is reputed to be extremely responsive to development questions. Joel Spolsky is the founder of Fog Creek Software and the CEO of Stackoverflow. He has been involved in a great number of projects using software like Excel and Visual Basic. His feed regularly showcases help videos and tips he feels would be useful to other software developers. Tips from the lead developer of Gmail and co-founder of FriendFeed can only be helpful. Paul also posts on current technology trends and news to keep his followers up to date on who is doing what. Kevin Marks helped build the Microformats markup appraoch. He was also involved in the engineering of Technorati. Although there does not seem to be much in the way of technical information on his feed, he does have an interesting sense of humor that will brighten the darkest day. I’ve been categorizing a bunch of websites for a recent project. I’ve learned that the web is a terrible and amazing place. For information on the range of Adobe products, Ryan Stewart is considered an authority. His tweets provide plenty of information that older users wish they had known from the start. Trying to watch funny cat videos leads to the neither regions of YouTube; a gadzillion overlays, popups, links, follow-ons, etc. As the creator of the Ajax Library, Thomas is definitely the man to pay attention to when anything Ajax is questioned. For tips on anything from Firefox to Spymaster, follow Thomas. The hardest part of design isn’t design, and the hardest part of coding isn’t coding. The hardest part is influencing people. Users of Mozilla will know that the Mozilla user interface is extremely user friendly. This is thanks to Aza Raskin. Keep up to date on Firefox, Ubiquity and Jetpack news on his channel. None of the software development lists about Twitter accounts to follow would be complete without the brains behind social media website. Jack Dorsey is the man who designed the Twitter architecture and, though he does not do much programming tweeting these days, he is a man to follow. For information on any or Lynn’s favorite topics, follow her on social media. She is also the course developer for Teaching Kids Programming, a fantastic program for young people to learn to code. According to the perverted ideology of some in Silicon Valley, you’re not entitled to critique its paradigm if you use its products. Ruby on Rails is still a popular coding language and David frequently sends out interesting links and information about this platform. Scott is the senior program manager for the Microsoft Developer Division. If there is anything to know about .NET, C# or a wide range of other Microsoft products, Scor is the one to tell you. In the world of feedback, friendly feedback and honest feedback aren’t even in the same universe. Be one who gives it straight. For practical advice as it relates to things such as project management and time logging, Jason Fried is the man to follow. He has been instrumental in the development of a number of business applications. .NET is an extremely popular programming language among web programmers. For hourly updates on a variety of web technologies including .NET, follow Elijah. Alex keeps his followers up to date on emerging technologies in a range of areas. This includes programming and business technologies. Responsive design and development is a major talking point with so many mobile users. Brad Frost is the expert of responsiveness and frequently tweets tips and tricks to help his followers. For information on security, FOSS and similar topics, Alison is well liked. She does have a tendency to be very open in her opinions and care should be taken if reading her posts at the office. Robert focusses on providing information for newer programmers. 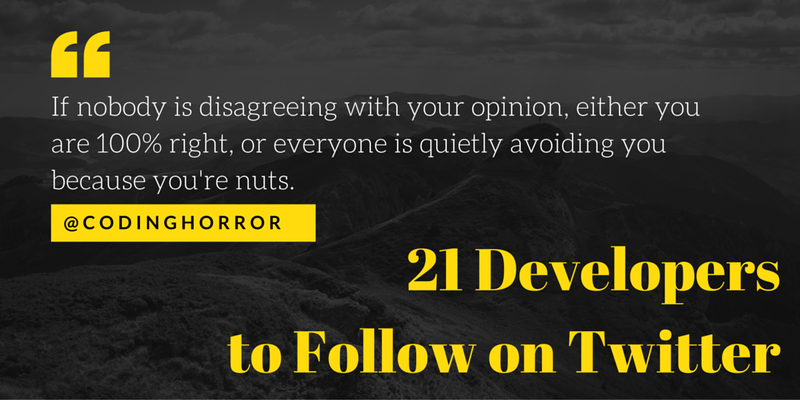 He provides plenty of development tips and is a must have for software development lists of Twitter channels to follow.